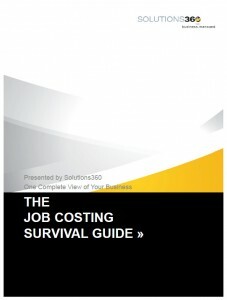 The Job Costing Survival Guide by Solutions360 allows business owners to get a detailed understanding of what they should be considering in their process in order to maximize the profitability of their projects. The guide looks at several key processes including job estimation, access to accurate data, resource scheduling and project transactions/costs. Download your Free Survival Guide Now.